It’s a good thing we got ahead of ourselves in February, because our March was far too busy to allow for any wine tasting. I went on two separate business trips, a friend of ours was in San Francisco from New Zealand, and Mike had many deadlines to meet. It’s unusual for us to have a month where we don’t get out of town, but in March we didn’t even manage to taste any wine in Monterey County, which may be the first month on record where that’s happened. Our palates were primed, our feet were itchy (with the urge to take to the road, not with athlete’s foot), and our blog was feeling abandoned. Fortunately, our friends Luke and Mary invited us to visit their favorite wineries in Sonoma, as well as Luke’s family’s farm. We meant to wait until after we dropped their kids off, really we did. But we passed so many great wineries on the way that it was inevitable someone would crack. In the end, it was Luke who could no longer resist. Mary brought the kids to the farm while Luke, Mike and I went to a winery that, surprisingly, Luke had never tasted at before: Jacuzzi Family Winery. I tried to hot tub in their fountain. They were not amused. 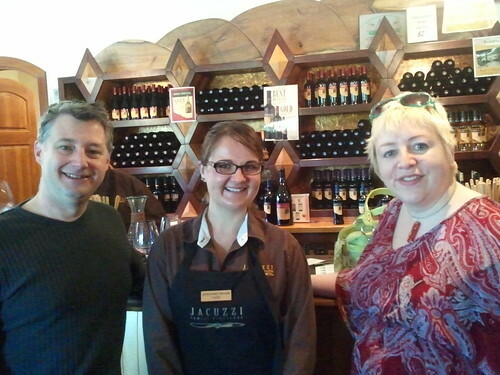 From the moment we stepped into Jacuzzi Family Vineyards, I thought, “This must be what Napa is like.” By and large, the wineries we’ve visited to date have been small family affairs. 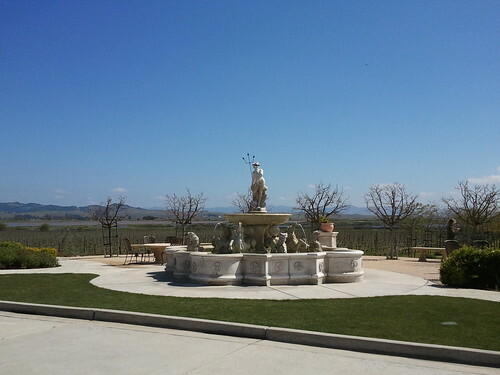 While Jacuzzi Family Vineyards is also a family affair — the owner, Fred Cline, is the grandson of Vanteriano Jacuzzi — both the family and the affair seem rather larger than what we’re used to. 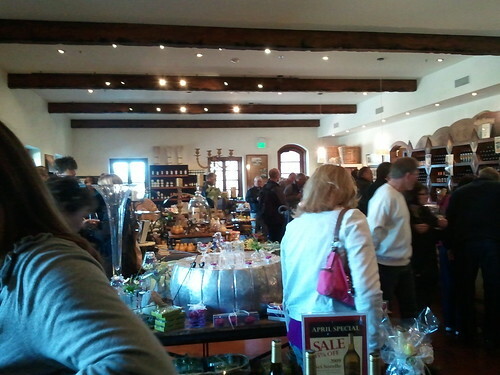 This is just one tasting room. There's an additional room for olive oil tasting, plus a covered back patio, plus that patio with the fountain - it's ginormous! There were three tour buses in the parking lot when we came in, but we were still easily able to find a spot at the bar. Mike and Luke held back the crowds just long enough for me to take this photo. Cary, the tasting room associate who was kind enough to pour for us, was friendly and efficient and told us everything we might want to know about the wines. Much to our surprise, we each got to taste six wines for free. Eighteen wines on the list, three people tasting…could we hit them all? Sadly, the whole “sharing” strategy didn’t occur to us until about halfway through. But we did taste a large portion of the list nonetheless. 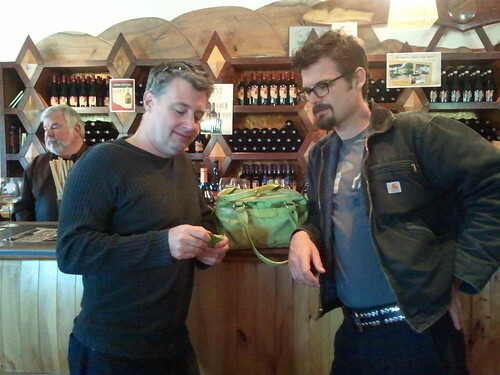 Luke and Mike discuss sharing wine...in a manly fashion. 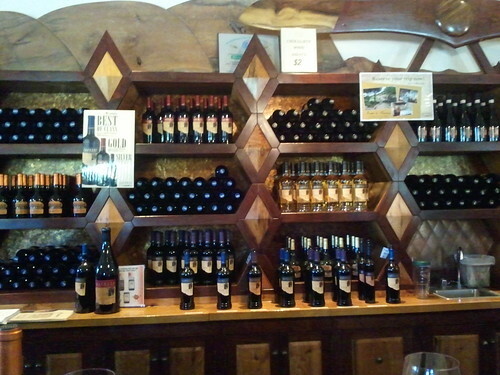 Fred Cline also owns Cline Cellars, whose Ancient Vines Zinfandel we’re a fan of. He established Jacuzzi so he could create some wines that referenced his Italian heritage. I am no expert on Italian wines, but I can say that these wines were delicious. I encourage Mr. Cline to continue exploring his Italian heritage! Tocai Friuliano, Alexander Valley, 2009: Italy may have been banned from using this name for their wines because the Hungarians are concerned it will be confused with the unrelated and prestigious Tokaji, but Jacuzzi has stuck with the traditional name. Arneis, Paicines, 2010: The great thing about tasting at a winery that’s doing something other than Rhône-style wines is that sometimes you get to taste something you’ve never heard of. I’d never heard of Arneis or Paicines. Wikipedia tells me that Arneis is a type of grape grown in the Piedmont region of Italy, while Paicines is a San Benito County AVA. As San Benito is over 50 miles from Sonoma, this AVA clearly doesn’t count, but that doesn’t mean the wine wasn’t great! It was similar to the tocai friuliano, but mellower; Mike noticed that the acidity emerged later and it was overall not as tart. This makes sense, as Wikipedia tells me that this grape was used to soften the harsh edges of the Nebbiolo grape in wines from the Barolo region. And no, Mom, if Wikipedia told me to jump off a bridge, I wouldn’t. Unless it was a really cool bridge. Bianco di Sei Sorelle Chardonnay, Sonoma Coast, 2009: This grape was named after the six original Jacuzzi sisters of the generation that originally emigrated to the U.S., and the label bears their photo. The bottle, unlike most of the wines from Jacuzzi, is a country jug style. This wine has a great nose, which reminded me of slightly sugared flowers. I tasted hints of dry mead when I sipped it. Of course, when I said that, Luke looked at me like I was crazy, so your mileage may vary. Mike found it acidic. Nebbiolo, Carneros, 2009: On to the reds! I smelled cherries and raspberries here; Mike smelled a hint of chocolate. As I sipped, I found the skins very present, with a hint of cherry in front. Mike tasted chocolate and felt it was a bit spicy, with nice acidity. I found the flavor very rich, and felt this would go well with a steak. (Says the vegetarian.) Mike found it warm, but a little reserved — which is exactly what I thought of him when we first met. Primitivo, Lake County, 2008: Cary told us as she poured it that this wine is “a little on the young side.” The scent was unusual, cinnamon and spicy pepper with underlying blackberries. Mike smelled charcoal, fruit, tobacco and lipstick. For me, the taste followed right along with the smell: blackberries, spice and a little astringency. Mike tasted fruit with slight vanilla and ester components, and some nice acidity that emerged late in the arc. Rosso di Settle Fratelli Merlot, Carneros, 2009: As the chardonnay is named for the six sisters, so this is named for the seven brothers. (Mike said that perhaps they should have a rosé named for seven brides. But I digress.) Mike said it smelled like cremé brulee, a combination of vanilla and toasted sugar, and he wasn’t wrong, but I also smelled a rich fruit underlining that. For me this tasted of caramel, oak and a deep meaty grape flavor, for him it tasted of creme brulee dusted with cocoa powder and a tannic floor. Either way, this was a yum. Montepulciano, Tracy Hills, 2009: I smelled chocolate frosted caramel and toasted oak. I couldn’t put my finger on the complex, subtle flavor, but Mike called it wood smoke, fruit and a hint of vanilla, with soft tannins. Lagrein, Paso Robles, 2008: After watching Mike and I share all our tastings, Luke just couldn’t resist any more and gave us each a sip of his wine. To me, the nose had stewed prunes with a little sugar; Luke got spice. The flavor was tart but complex with a hint of oak. There were three reserve wines also available for tasting for $1 each, but Cary was kind enough to comp us. I’ll try not to let that influence my reviews. Pina Prosecco, Asolo Italy, 2010: I always thought it was pronounced pro-CESS-oh, but Luke and Cary put me straight; it’s pro-SEK-oh. This one was a little dryer than what I’m used to. There was acid and a hint of almond on the nose, and the taste was of citrus with that same hint of almond underlining it. Mike felt the flavor had an added richness you don’t find in standard sparkling white. Valeriano, Carneros, 2007: This had chocolate covered plums on the nose and a nutty and tart flavor. Mike smelled vanilla and berries and tasted fruit and tobacco notes. Late Harvest Aleatico, Sonoma Valley, 2008: This grape isn’t frequently planted, Cary told us, but according to Wikipedia there is something of an Aleatico trend beginning. (I know, Wikipedia again! So sue me!) I smelled sugar, strawberry, raspberry and cream; Mike smelled dried pineapple. I tasted a hint of yeast along with sugared plum; Mike tasted raisins, prunes and pineapple. This was a great way to kick off what we knew would be an exceptional day. We tasted from a wide range of AVAs, but under our rules only four counted: Alexander Valley, Sonoma Coast, Carneros and Sonoma Valley. Great Review and Thank You Very Much! Fred Cline’s maternal Grandfather was Valeriano Jacuzzi…second oldest of the Seven Brother’s …there are lots of Great Stories to Tell! Catch Fred soon! Previous PostPrevious Our progress: Two months, 16 appellations. Wait, WHAT?